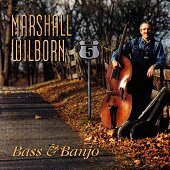 One of the best bass players in Bluegrass (voted "best bass player of the year" in 1998 by Bluegrass Now Fans), Marshall Wilborn's aptly titled BASS & BANJO is a mainly-instrumental album that shows the dexterity and skillfulness of this talented bluegrass musician. But, despite the great craftsmanship and experience that went into making this record, the lack of vocals, which only make an appearance on "I've Been All Around This World," one of the thirteen tracks on this album, stagnates this album and pushes it from great to decent. I love bluegrass music, but its main attraction for me is the vocal harmonies and sheer transformation the music takes when a vibrant voice colors it up. But, that is lacking here. Obviously, my favorite cut here is "I've Been All Around This World." And, though the rest of the tracks have tremendous bluegrass blood flowing through them with enough chops to put many bluegrass bands to shame, after a few listens they tend to run into each other and turn into one really long number. Except, "Oh, Susanna," an amazing instrumental that should be heard. A classic cut reborn, Marshall Wilborn's bluegrass take on this is nothing short of exceptional. At last, though, the lack of vocals hurts the album. Though, it does have its moments (like putting it on for background music and finding yourself dancing and moving along to it on occasion), if you want a record that you'll put on to really get into, this is not it. But, for background support, nothing beats it. I'll give it a B-.